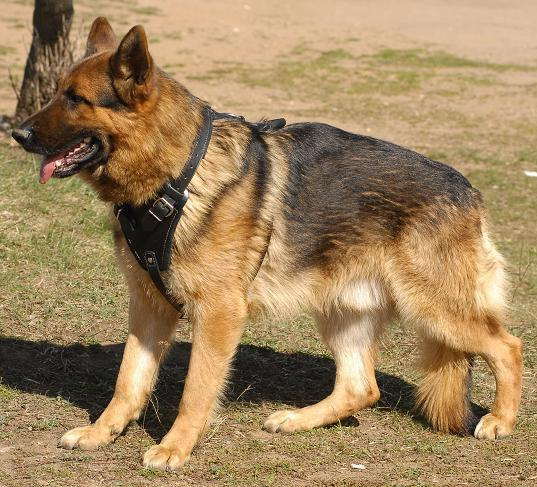 Heavy duty full leather Protection harness.This is truly beautiful piece of hand made working dog equipment!One of the best available harnesses.The agitation harness is some of the most functional and handsome on the market today. 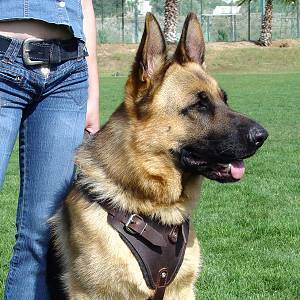 Made for agitation or protection work our agitation harness is built for strength and comfort.Our agitation harness is expertly crafted to provide maximum strength and durability. A precisely designed breast plate is lined with extra thick felt to offer supreme comfort for your dog and to absorb the shock of a strong dog hitting during bite work.Specially built for the stress of agitation work.The dog harness is designed to fit almost any sized working dogs.It's five way adjustable so you can adjust it to fit to your dogs dimensions.Once all straps are adjusted, the dog harness can be quickly put on the dog by using only one buckle and strap.This harness is handmade from high quality, heavy duty strong leather.It is flexible and will not rub or wear into the skin of your dog. ?Designed so the resistance is on the shoulders and not on the throat our agitation harness allows dogs to bark and track in free way and still be restrained enough.Straps are 1 1/4 " wide, and assembled using capped rivets for extra durability.Made of finest quality soft and strong leather with nickel buckles and rings that won't rust for long life.D ring is stitched and rivetted so it won't pull out.This heavy duty Protection harness is valuable tool for agitation work,designed to withstand the rigors of professional K9 duties. 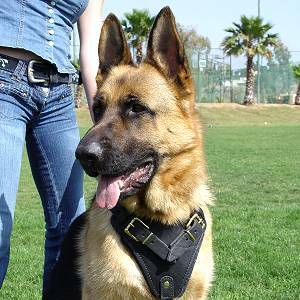 Our Protection harness will quickly become your favorite trial or training equipment! Just to let you know that the new harness for my service dog arrived yesterday (March 31) and fits beautifully, Thanks for getting it to me with plenty of time to have him get used to it before the Wedding.